Before I saw down to watch the entire fourth season of Hercules: The Legendary Journeys, I hadn’t before seen a single episode of the show (nor that of its spinoff, Xena: Warrior Princess). I knew that super-cool cult figure Bruce Campbell made the occasional appearance, but that was about the extent of it. And though my knowledge of the show’s backstory was limited to the scant information given in the opening credits, I found myself really getting into these episodes. 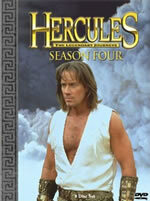 The show’s structure is reminiscent to something along the lines of The Fugitive, with Hercules (Kevin Sorbo) and his faithful sidekick Iolaus (Michael Hurst) traveling from town to town helping out those in need. Of course, there are larger story arcs at work here – including Hercules’ ongoing rivalry with Ares (Kevin Smith), the God of war. Lucy Lawless’ Xena also pops up occasionally, while Campbell’s Autolycus is always good for a laugh or two. The most intriguing aspect of Hercules: The Legendary Journeys is the way it refuses to take itself seriously. The show is packed with contemporary references (ie after walking into the gigantic lair of a half-woman/half-spider, Hercules remarks “this is one big web site”) and surprisingly funny moments of physical comedy. It comes as no surprise that director Sam Raimi is listed as one of the series’ executive producer, as his love for Three Stooges-esque hijinks has been made quite obvious in some of his movies (Army of Darkness being the most obvious example of this). Of course, the show wouldn’t be nearly as entertaining as it is if not for the efforts of star Sorbo. An incredibly charismatic performer, Sorbo does a fantastic job into turning Hercules – a half man/half god – into someone that we can relate to. But more than that, Hercules becomes a figure that we’re really rooting for; though he’s seemingly invincible, Sorbo ensures that the character always remains down-to-earth. His relationship with Iolaus goes a long way towards achieving that goal. Though Hurst is generally called upon to provide comedic relief, the friendship between Iolaus and Hercules provides the show with its emotional core. This collection from Anchor Bay collects all 22 shows from the show’s fourth season, effectively mixing dramatic and comedic episodes. The highlights include: “Stranger in a Strange World,” which finds Iolaus thrust into an alternate universe where Hercules is an evil dictator (he sports a goatee! ); “Men in Pink,” a hilarious episode in which Hercules and Autolycus pretend to be members of an all-girl dance troupe; “Yes Virginia, There is a Hercules,” a bizarre episode set in the real world after an earthquake leads to Kevin Sorbo’s disappearance; and “Reunions,” the season finale which further explores Hercules’ fractured relationship with his father, Zeus. Audio: Every episode in this set is presented with a DD 5.1 soundtrack, and considering the fact that this is a TV show, the sound is quite impressive. Virtually every episode makes good use out of the surround channels, particularly during the fight sequences, in which it feels as though the viewer is sitting right in the middle of these battles. Quieter moments are just as effective, with the show’s dialogue always coming through crisp and clear. Video: Likewise, the transfers on each of these episodes is crystal clear. It probably helps that each disc only holds three episodes, meaning that artifacts are none existent. As far as TV shows on DVD go, it really doesn’t get much better than this. Extras: Ah, here’s where the set really comes to life. After going through every single extra on these nine discs (! ), one walks away with a distinct impression of what it takes to make a show like this. Virtually every episode is accompanied by either a commentary track or some interview footage. The participants in the commentaries varies, but Sorbo or Hurst can be found on all of them. These tracks are exceedingly interesting, with discussions on what kind of problems where encountered on a specific episode or what it was like working with guest stars. As for the interviews, these generally run about 10 minutes each and feature input from the producers and stars. Like the commentary tracks, there’s a lot of interesting tidbits and quirky fact to be gleaned out of them. The eight disc in the set features 26-minutes worth of dailies from the “Stranger in a Strange World” episode, which is a neat feature – though hardly essential. Far more intriguing is the 17-minute tour of the KNB effects lab (they’re the guys that come up with all the show’s special effects). Finally, a ninth disc of CD-ROM content is included, which contains all kinds of information and backstory on the show. Conclusion: Even if you’ve never seen a single episode of Hercules: The Legendary Journeys, there’s no denying that the show is easy enough to get into. The off-kilter sensibility makes it an addictive pleasure, and Anchor Bay’s stellar presentation should be applauded. Please help support our site by buying this DVD title through this link. Thank you kindly.